Etruscans loved shiny things. The more glittering and ornate the better. The most stunning examples of jewellery and art came from the era known as the ‘Orientalizing’ period from ca. 720-575BCE. This was a time when Phoenician and Greeks were attracted to Etruria due to its rich metal deposits. The Phoenicians were a sea faring people with extensive trading interests across the ancient world. Originally from the area we now know of as Lebanon, they also set up a colony in Carthage (modern Tunisia).Through their trading links, goods from Egypt and Assyria were imported into Etruria and graced the houses of the wealthy. Enormous bronze and silver mixing bowls were decorated with mortal and mythical animals: scarabs, panthers, winged lions, chimeras and sphinxes. Ivory inlaid boxes were popular as well as faience vases (tin glaze on earthenware) and even decorated ostrich eggs (a symbol of fertility). Strange glass ‘porcupine’ vases in the shape of tiny coloured glass jugs with spiny bodies have been found and glass beads were used to decorate fibulae (brooches) and necklaces. Amber was popular and of course – gold. Sophisticated techniques that involved filigree, engraving, repousse (hammered relief decoration) and granulation (where tiny grains of gold were soldered to cover the surface of an object) were all employed by gold smiths to stunning effect. Etruscans covered themselves with jewellery such as golden wreaths, necklaces with heavy ball shaped pendants, rings and bullae (lockets). Some pendant earrings were four inches long or were shaped in heavy grape clusters. Tiers of tiny gold beads were strung together as bracelets or diadems. And all this finery was kept in cylindrical containers known as cistae which were divided into compartments where mirrors, combs and perfume bottles were stored. 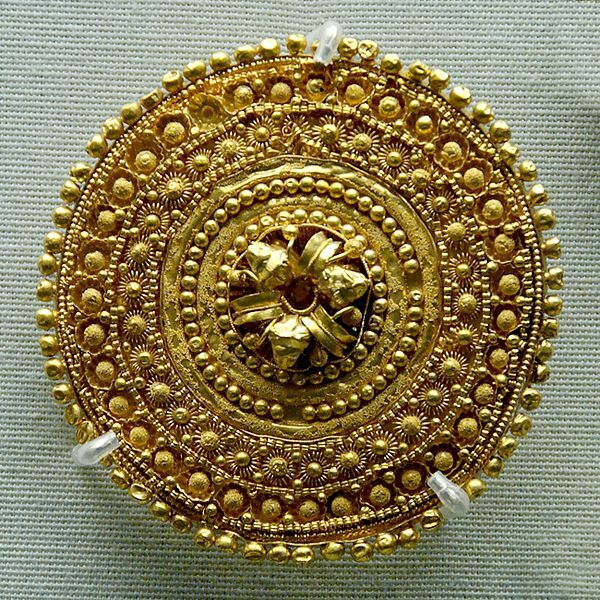 So when you think of designer jewellery –or stylish home wares– the Etruscans paved the way.